Classic Cars For Sale magazine is the classic car magazine for anybody who loves buying, selling, owning and running classic cars. 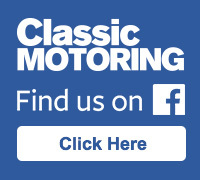 Whether you like family Fords, American muscle, or fast Ferraris, fixing them or simply driving them, Classic Cars For Sale features classic car reviews to suit everybody‘s tastes and pockets! Each month a wide variety of classic cars for sale in the UK are assessed, tested, rated and subjected to buying scrutiny by industry experts - so that readers are given the top advice on getting the most out of their classic car. Classic Cars For Sale publishes some of the most comprehensive and critical buying guides in the business. Called, Classics to Consider, they detail the car's history, driving appeal and list worthwhile improvements to make modern motoring more pleasurable. Then comes the really important bit - up-to-date prices and the most detailed buying checkpoints you'll won't find anywhere else. In fact our Classic To Consider guides are so informative that they are used by major car clubs to help their members. Our classic car reviews also includes the popular Auto Assessment series of road tests which appraise classics in real world driving conditions to see how they stack up for today's enthusiast - either as a daily driver or simply as a weekend plaything. And where we can, we also reveal what contemporary road tests said at the time to see if their opinions are still valid. Pitching classics head-to-head, our Clash of the Classics series takes the theme further and compares direct classic car rivals so readers can make a direct comparison to see what's the right classic car for them. Classic Cars For Sale doesn't limit itself to simply classic car reviews though. We also look in depth at , commercial vehicles, vintage and veterans, motorsport, classic car auctions, products and much more.